Christmas 2015 - Website of kennetaccordionorchestra! Christmas 2015 - KAO had a busy festive season 2015. We were asked by two local Rotary Clubs to play at their Christmas parties. Hungerford Rotary Club held their party in the Town Hall in Hungerford and the orchestra entertained them with festive songs and popular pieces, which had them dancing round the tables! The candlelit evening was very appropriate for the time of year and everybody enjoyed the evening, players and audience alike! The Marlborough Rotary Club held their party at the Marlborough Golf Club and after their Christmas dinner, the orchestra played several festive tunes and other pieces, which were warmly received by an appreciative audience. On 12th December, the orchestra held their own Christmas concert at the Kennet Valley Hall in Lockeridge. They had asked the Kennet Singers to be their guests and the evening was to raise money and awareness of the Motor Neurone Disease. The concert was held in memory of Ronald Morrison, who sadly died in May 2015 from the disease and his widow Betty was at the concert and talked about the illness and that it is a disease that not everybody knows about, as there are only about 5,000 people in the country with it. 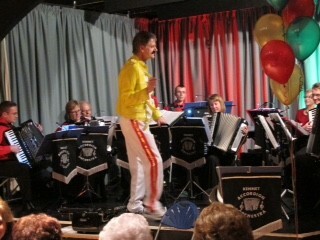 The concert was a great success and raised £450 for the charity. The orchestra also played for residents at Redwood House in Hungerford and entertained them with festive tunes and they played some percussion instruments and had a really great evening of fun and enjoyment.